Home » Blogging » Why Did I Start Blogging? 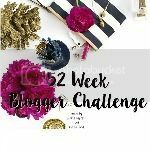 Today (and probably most Monday’s for the rest of the year) i’m linking up with Sarah Emily Blogs for her 52 Week Blogger Challenge and the prompt for the week was “Why Did I Start Blogging?” I love reading bloggers bios and what inspired them to start blogging so I thought i’d share my story here. Ps- someone please give me some advice for my “about me” page. I’ve updated it about 1 million times and i’m still not too thrilled with it. HELP! And then, something pretty amazing happened. I was starting to get comments on my posts. People were reading! Turns out when you comment on other people’s posts and they have the same interests as you do, they tend to want to read what you have to say as well. I don’t have hundreds of thousands of views or even more than 100 followers but, the people that do read my blog have become my little family and I care about each and every one of them. Over the past year i’ve made a bunch of blogging friends and am so thrilled to say that because of my blog i’ve felt way more confident in myself and that has translated to the outside world. I am by no means an extrovert, but I’m finding that i’m becoming more comfortable in social situations because I know that people do value my opinion and people do want to hear what I have to say about things. I feel like the whole wide world has been opened up to me in a way it never was before. I know I veered a little bit off topic but I’ve been meaning to share how I felt about you guys how positively you’ve impacted my life. So thanks to each and every one of you who spend a couple minutes to read my blog posts and remind me that my voice is worth hearing! Question of the day: Why did you start blogging?